When it comes to making fresh, healthy baby food, it doesn’t get any easier than this! 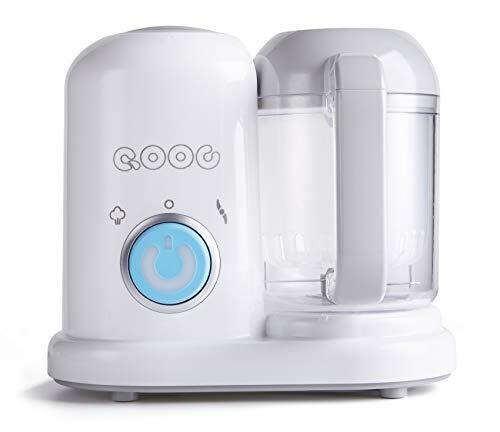 The QOOC makes mealtime a snap with the power to prepare nutritious baby food at home. One compact machine does it all—chop, blend, steam and defrost! Our baby food processor features a high-grade precision blade that allows you to blend anything from fruits to nuts to veggies and even meats with ease and control. A nearly silent steaming function helps you get the perfect consistency every time. This machine incorporates a large bowl for creating big batches of healthy food you can freeze and store for convenient future use, You can even defrost previously prepared batches in your QOOC. A small footprint means it does not take up too much space on your counter. And easy one-handed controls are perfect for busy moms who multitask! No more relying on store-bought jars of food—you’ll know exactly what’s going into your baby’s bowl. The QOOC also makes the perfect gift for any mom-to-be. 2. Chop first then move on to the puree setting to achieve a smooth consistency. Our innovative steam blade creates even steam distribution for fast and extremely efficient results. 3. The included bowl seals to prevents spilling and keeps steam locked in. 4. When you’re ready to pour, the patent-pending blade lock system keeps the blade in place and out of your way. 5. Large storage containers are great for bigger batches and fit perfectly onto specially designed racks inside the baby food processor for easy reheating. Note: When you are using grinder, we suggest you press it every 5 seconds to grind, after 3 times you will get a delicious puree. 4 Powerful Functions in One Compact Appliance-the perfect way for busy moms and dads to steam, blend, reheat, and defrost healthy homemade baby food in just 15 minutes! Innovative One-Handed Controls Plus Quiet Motor-Mom won't even need to put baby down to use this baby food maker! It's quiet and easy to cook and store food with just one hand. Premium Precision Prep Blade-makes it fast and easy to quickly chop/puree everything from fruit to nuts to veggies with the press of a button. Pulse every 5 seconds to grind. In just 3 rounds, you'll have a delicious puree. Convenient MINI Size-compact size means it stores conveniently out of the way and it's easy to clean. All components are dishwasher safe and BPA FREE. Constructed of Safe and Innovative Materials-Premium Materials are BPA, Lead, and Phthalate free and shatterproof so you can create healthy meals for your baby with confidence. Power input restriction supports 120v only. If you have any questions about this product by minne, contact us by completing and submitting the form below. If you are looking for a specif part number, please include it with your message.